Lake Urmia, a vast salt lake in Iran, is shrinking dramatically due to water diversions from its river tributaries. The lake is shown here in June 2014. Click image to enlarge. In the past year alone, water levels dropped to record lows in Iran’s Lake Urmia, a die-off of rare and ancient sponges occurred in Russia’s Lake Baikal, blooms of toxic algae shut down drinking water supplies in North America’s Lake Erie, and construction began on a major shipping canal that scientists warn could devastate Central America’s Lake Nicaragua. Fixing these problems will be expensive both economically and politically, experts say. Failing to address them, however, will jeopardize the large lake ecosystems that underpin the economic, environmental, and cultural vibrancy of regions around the world. The Great Lakes, for example, support 1.5 million jobs and generate $US 62 billion in wages in the United States. Lake Baikal, the biggest and oldest lake in the world, is home to approximately 2,500 species of plants and animals and is such a cultural treasure in Russia that it has its own anthem. Moreover, the 10 biggest lakes in the world hold approximately two-thirds of Earth’s available surface fresh water, an increasingly scarce resource. While there is an array of symptoms afflicting large lakes—from invasive species to harmful algae to declining water levels—the root cause is water management systems that are slow to put ecosystem health above industrial and agricultural interests. Lakes in developed countries suffer from the legacy of this model, and lakes in the developing world are at risk from managers repeating the same mistakes. Despite their size, history has shown that even the biggest lakes are vulnerable to human influence. In 1969, Lake Erie was so polluted that one of its tributaries caught fire. The Aral Sea, once the fourth largest lake on Earth, is now so shriveled from water diversions that it no longer makes the top 15. 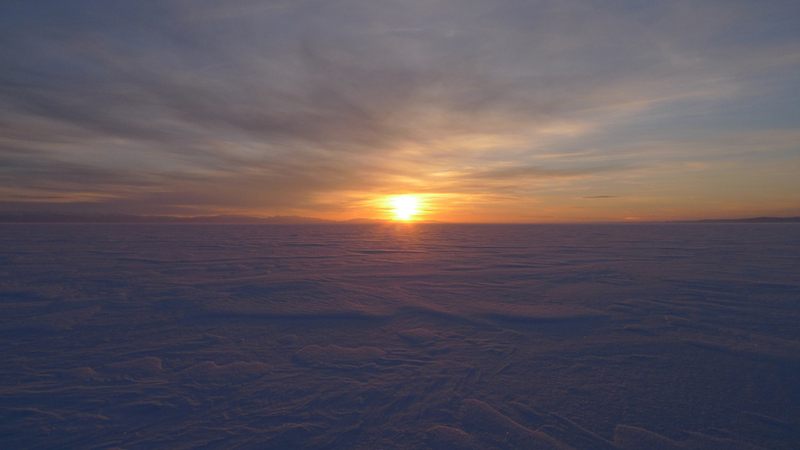 During a public lecture in April, Robert Sterner, director of the Large Lakes Observatory at the University of Minnesota-Duluth, summed up humanity’s ability to either threaten or protect large lake ecosystems. 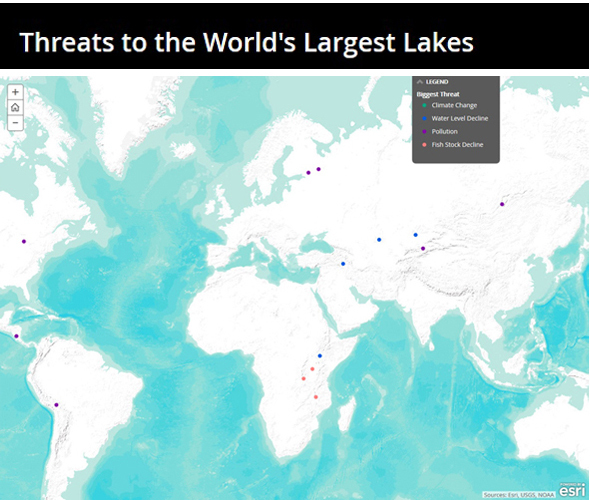 This map depicts the world’s largest 20 lakes by surface area. The lakes are divided into four categories based on the biggest threat they face—pollution, climate change, declining water levels, or declining fish stocks. Click here to view an interactive version and learn more about each lake’s specific challenges. Central Asia provides some of the most striking displays of human influence on big lakes. 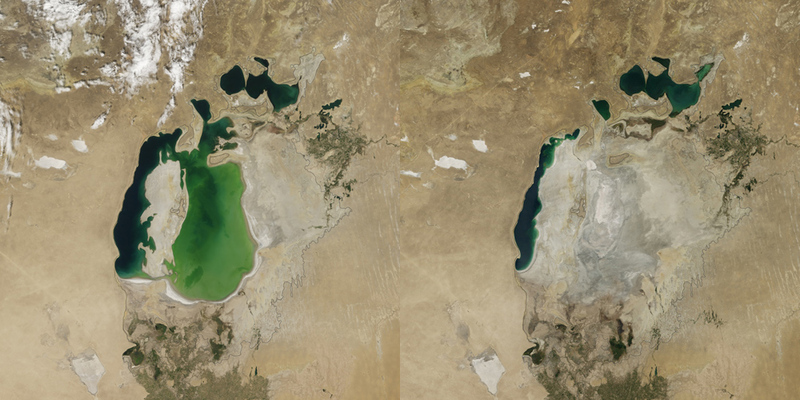 Satellite photographs show the Aral Sea, straddling the border of Uzbekistan and Kazakhstan, receding from a robust water body to little more than a sliver between the 1960s and today. Last October, a NASA image revealed that the lake’s large eastern basin had dried up completely. Like the Aral Sea before it, Lake Urmia—a vast, shallow, saltwater lake in northwestern Iran—is also shrinking rapidly. The surface area of the lake has declined 88 percent since the 1970s, according to a study published in the Journal of Great Lakes Research in March. Tourism in the region has fallen with the water levels. Serious health risks are on the rise as dust storms pick up salts from the exposed lake bottom, sweeping them across towns and farm fields. 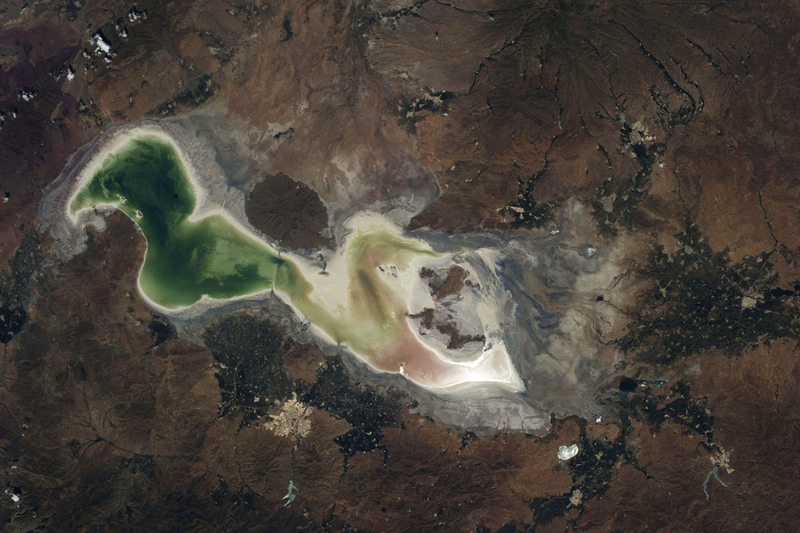 Lake Urmia has been plagued with droughts during the past decade, but cycles of water scarcity are nothing new in the arid region, researchers say. The March study found that the frequency of droughts affecting Lake Urmia has not increased significantly. Water diversions for growing cotton and other crops have left boats in the Aral Sea high and dry.Click image to enlarge. Instead, water management decisions influencing the flow of freshwater rivers that supply the lake are likely to blame for the disappearing lake water. Iran is constructing dams to supply expanding agricultural fields that siphon water away from the lake, much like the expansion of cotton fields in the mid-20th century led to the drying of the Aral Sea. The result is a “socioeconomic drought,” explained the Imperial College’s Madani, another of the study’s authors. A socioeconomic drought is simply a human-made drought, created when demand for water outstrips the supply, Madani said. It is not unique to Lake Urmia or to Iran. Iran, like other developing countries, is in an era of “hydrologic mission,” according to Madani. The country is trying to reap as much economic gain from its water as possible, with little regard to the environmental outcomes. Similar situations are playing out in China, where projects like the South-North Water Transfer Project are moving massive amounts of water out of the Yangtze River basin to supply economic development, and in California, where water supply projects have led to the drying of the state’s largest lake, the Salton Sea. 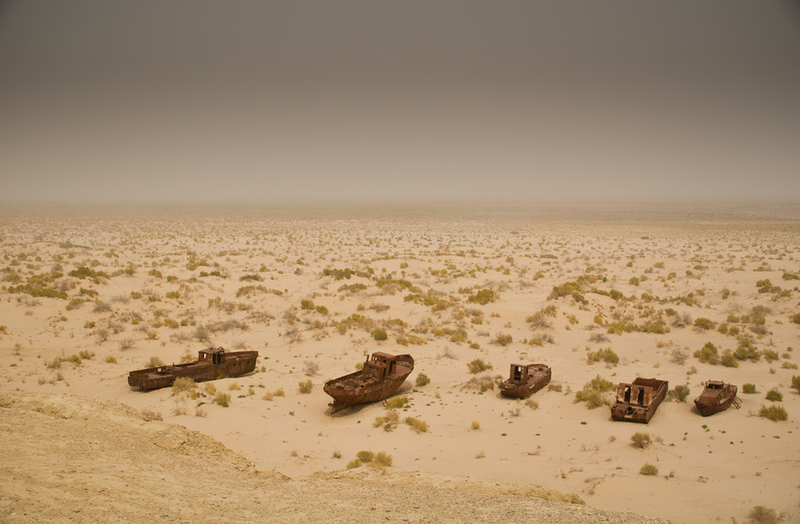 The Aral Sea, once the fourth largest lake in the world, has been shrinking steadily since the 1960s. The image on the left shows the sea in 2000, while the image on the right shows it in 2014.Click image to enlarge. Hassan Rouhani, Iran’s president, vowed to save the lake during his election campaign, and last year approved a $US 500 million plan to restore it. The government has also acknowledged that the dropping water levels are a man-made problem, not just the result of natural droughts. Large lakes are under duress not only in the developing world, but also in countries like Russia and the United States. Algae blooms, caused by an excess of nutrients from fertilizers and sewage washing into the water, are one of the most widespread and troubling issues afflicting lakes in developed countries. Nutrient pollution, known as eutrophication, has long turned small, inland lakes green with scum—some of it toxic to fish and other animals. Over the second half of the 20th century, the problem also emerged in large lakes like Lake Erie in North America, Lake Victoria in Africa, and Lake Taihu in China. Even Siberia, home to Lake Baikal, the world’s deepest and most ancient lake, has not been spared. Changes in water levels are one of the most often reported water stories around the world, but in many cases they do not have a significant effect on the health of large lakes. Even with water level management tools like dams, water levels can shift drastically in the span of a few years. This is especially true in the North American Great Lakes. A graph of Great Lakes water levels over the past century looks like a mountain range, full of peaks and steep valleys. Following a drop in water levels in the late 1990s, the lakes remained low for more than a decade. Cold temperatures led to extensive ice cover, in turn preventing evaporation from the lakes and causing water levels to rise. Now, lake levels are near their long-term average again. “They’re not out of bounds of what we’ve experienced before, but the pace from which they went from almost record lows to normal-ish was really striking,” Sterner said. Excessive nutrients, most likely from outdated sewage treatment facilities in coastal cities, are now spoiling the waters of Baikal with waves of an alga called Spirogyra. During the fall of 2013, researchers found blooms of the algae along the northwest coast of the lake, near the town of Severobaikalsk and the estuary of the Tyya river. “Rolling waves threw a viscous black and green organic matter which formed on the coast foul-smelling swells stretching for hundreds of meters,” says an English translation of a report describing the incident. The report, published in Russian media outlet Science Firsthand, was written by Oleg Timoshkin, a researcher at the Irkutsk Limnological Institute. The unsightly blooms are a detriment to tourism, and scientists are not yet sure what effect, if any, they will have on Baikal’s unique biodiversity. Despite its icy cold waters, the lake hosts thousands of species of plants and animals. The majority of them are endemic, meaning they live nowhere else in the world. In the past two years, researchers found that certain lake sponges, some of which take hundreds of years to grow, are dying en masse. The cause of the deaths is unknown, and it is unclear if they are linked to the algal blooms. Lake Baikal, the world’s largest lake by volume, is a national treasure in Russia. The freshwater lake is home to an impressive array of plants and animals.Click image to enlarge. Another threat could come from proposed hydropower and water diversion projects in the Selenga River basin, the primary tributary to Lake Baikal. Much of the basin lies in Mongolia, which is planning two dams—one on the Selenga River to produce hydropower and one on the Orkhon River to supply water to mining projects in the Gobi desert. In February, the environmental organization Greenpeace sent a petition protesting the dams to the World Bank, which is backing the projects. According to Bill Mckibben, the ideal parts per million of Carbon in our atmosphere would be 350ppm, that was in 1975. Now we our at 404ppm and rising, we have a Atmospheric budget of 556 Billion Toxic Tons of Carbon to emit and then we would increase Temp. to 2C, this was in 2012. that leaves us with 406 Billion more Toxic Tons to burn, which would bring us to 2019 – 2020. What will the Temp. be then ? Here is a Link saying we have No Atmospheric Budget. In the 1850s parts per million of carbon was 260 – 280. Right Now we have 404 parts per million of carbon in our Atmosphere, the Arctic is 75% gone and Melting, Greenland and Antarctica are calving. The North west Pacific Ocean is 5-8 degree warmer than normal. Whales, Dolphins, Sea Lions, Starfish, Die Off along the Western Coast of the Pacific Ocean over the past year . Ocean Acidity levels climbing, Mercury 3x more than the start of the Century. When will Sea Level Rise to 250 300 Feet ? 2020 ? 2025 ? ? We emitted 40 -50 Billion Toxic Tons of GHGs Globally, in the United State we emitted 6.8 Billion Toxic Tons, and are leading the charge to Frack the Globe. We Need 100% Renewable Energies . No Twin Tunnels, Save the Delta, this Fragile Eco-System is a measurement of our commitment to bring in Sustainable Energy Policies. Cap and Trade Phased Out. 75% Airport reduction in Carbon emissions. Golf Courses should be on Gray Water or Closed. California Residential Feed in Tariff would allow homeowners to sell their Renewable Energy to the utility, protecting our communities from Poison Water, Grid Failures, Natural Disasters, Toxic Natural Gas and Oil Fracking. Our California Residential Feed-In Tariff should start out at 16 cents per kilowatt hour, 5 cents per kilowatt hour to the Utility for use of the Grid, 11 cents per kilowatt hour going to the Home Owner.